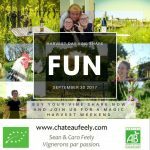 Chateau Feely sparkling Brut Rosé is a delicious proper traditional method dry sparkling wine – the perfect match for a celebration. Feely certified organic sparkling brut rose has had 9 months of bottle fermentation so it is ready just in time for the sparkly season. 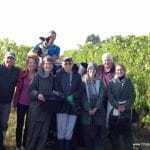 It is 100% merlot handpicked on 5 September 2016 by a loving team of dedicated pickers. 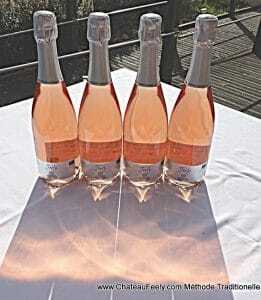 Once we had made the very dry and zesty low alcohol (11.5%) wine it went on to become a traditional method sparkling. 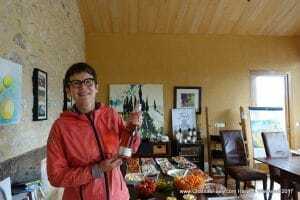 What makes a wine sparkling and why am I going on about a traditional method? There are three ways to make a wine sparkle. The cheapest method is to pipe in CO2 like a cola, the middle method is to create a second fermentation in a tank then capture the bubbles of that fermentation in a bottle, and the third and most expensive is the ‘méthode traditionelle’, the traditional method, where the second fermentation that creates the bubbles is in the bottle. With the first way the bubbles will be large and rough as they are in a soft drink. Bubbles and sweetness can cover up a multitude of sins so these are often made with low quality wine to start, wine you wouldn’t drink if you tasted it without the added sugar and bubbles. When you buy most Protected Designation of Origin (PDO) sparkling wine like crémant de Bordeaux, crémant de Loire, champagne or cava you are guaranteed that it has been made via the second fermentation in the bottle, a method Dom Pérignon is said to have discovered by chance and lead to the famous quote ‘come quickly, I’m tasting the stars’. So with MT like this one, the bubbles are created by this controlled second fermentation, the carbon dioxide produced by that fermentation is kept trapped inside the bottle until it is enjoyed. The result is smaller, finer bubbles and a biscuity brioche touch from the ‘autolysis’ (self-digestion) of the lees (the leftover dead yeast cells). The sugar content of the sparkling wine must be noted with the terms ‘brut nature’, ‘zero dosage’, ‘extra brut’ for extra dry, ‘brut’ for dry, ‘demi-sec’ for off-dry/ semi-sweet and ‘doux’ for sweet. Interestingly it is mandatory to state the level of sugar on sparkling wines but optional (and regulated) for other wines. On another note in Feely wine school I am often asked about Champagne versus Prosecco? Prosecco has become a very fashionable drink for celebrations given it is less costly than champagne but what are the differences? Firstly Champagne is from France and Prosecco is from Italy. Champagne is made with Chardonnay, Pinot Noir and Pinot Meunier grapes while Prosecco is made with the Prosecco (Glera) grape. Perhaps the most important difference is that Champagne has to be made by the more expensive MT bottle-fermentation method, whereas Prosecco can be made by the less expensive tank method (the second fermentation takes place in a tank then it is bottled). Prosecco is generally fizzier and lighter, with more fruit and flower aromas while for champagne the bubbles are finer, sharper and more persistent, plus it should have a toasty or biscuity note from its long ageing on the lees in the bottle. 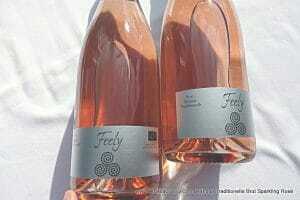 We launched Feely Sparkling Brut Rose this harvest weekend and it was a big hit with guests. It is now available on the website for purchase at https://chateaufeely.com/product/mt-brut-rose/. We’d love to hear what you think of it. Cheers!